Starting with the Ausf H version in October 1940, Panzer III incorporated a 50-mm gun. This gun also proved ineffective as a tank kIIIer and was replaced in the middle of Ausf J production with a longer, improved 50-mm gun. This armament configuration continued through Ausf M production. Many earlier Panzer IIIs were retrofitted with the longer 50-mm antitank gun to improve their battlefield effectiveness. The fighting compartment surmounted by the turret is in the centre. On the PzKpfw III there is no floor in the turret, although seats for the commander and gunner are suspended from the turret wall. The loader, who stands on the right-hand side of the gun, has no seat and must therefore walk around with the turret as it traverses. The gunner sits forward on the left-hand side of the gun. The 5-cm gun is fired electrically by means of a trigger on the turret traverse hand wheel, and the coaxial MG mechanically by a foot-operated trigger. The commander sits in the middle at the rear of the turret. His cupola is integral with the turret, and six ports fitted with bulletproof glass blocks and sliding steel shutters provide all-round vision. The cupola hatch consists of two hinged flaps. An auxiliary turret-tra-versing handle on the loader's side allows dual control for quick traversing, as no power traverse is provided on this tank. By early 1942 it was very clear to the German army that even the improved longer 50-mm gun fitted to the J through M versions of the Panzer III was ineffective against the Soviet army's medium and heavy tanks. In response, the Germans mounted a 75-mm howitzer in the Panzer III. With this change in armament the vehicle was designated the Panzer III Ausf N. German industry would build 663 examples of the Panzer III Ausf N between June 1942 and August 1943. Thirty-seven additional vehicles were also constructed from earlier rebuilt versions of the Panzer III. The 75-mm howitzer on the Ausf N fired a far more potent high-explosive round than the 50-mm gun on earlier versions of the Panzer III. It could also fire a wartime-developed shaped-charge antitank round. The Panzer III chassis was employed in a number of different roles including command center, flame-thrower, ammunition supply, and antiaircraft. The best-known and most widely deployed variant of the Panzer III chassis was a turretless assault gun: the Sturmgeschuetz or StuG III. The StuG III assault gun requirements were established in 1936. Five prototypes, designated Ausf A, appeared the next year. The first early-production vehicles rolled out of the factory between January 1940 and May 1940. Volume production began with the Ausf В version in June 1940. By May 1945, German tanks industry had built more than 9,000 StuG. IIIs in various versions. 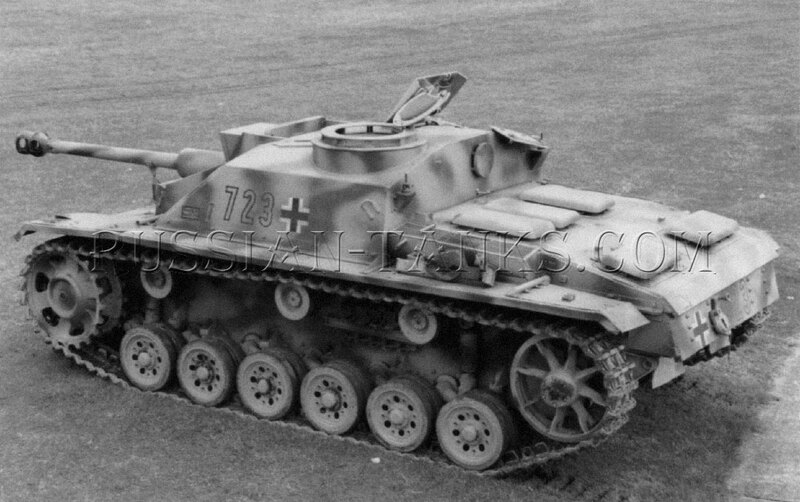 Early versions of the StuG III (Ausf A through E) were armed with a 75-mm howitzer. This gun reflected the original role of the StuG III as an offensive infantry support weapon, and it was successfully employed during the invasion of France in May 1940. 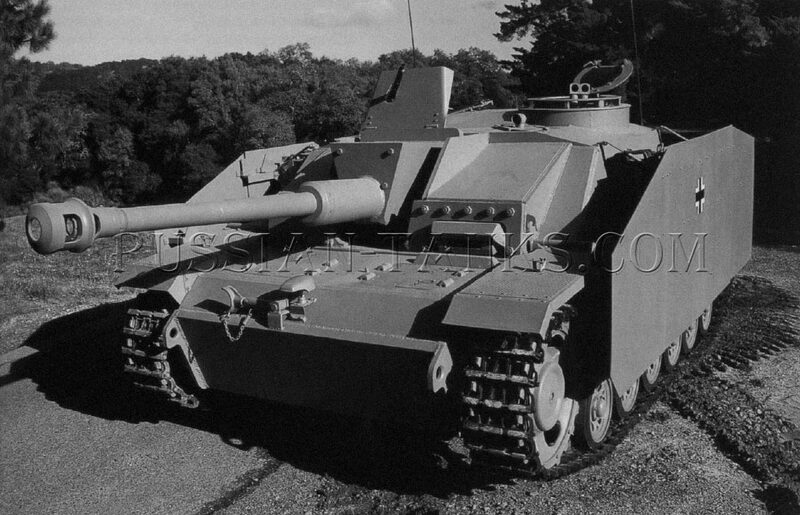 In a report completed during World War II, the U.S. Army described how the Germans regarded the StuG III in the infantry support role, as a decisive weapon to be employed at die forefront of an attack. Working together with the infantry, the StuG III was designed to break through enemy defensive lines. Its biggest advantage was its ability to follow the infantry right up to the objective. Once in sight of the objective, the crew of the StuG III was to use its gun at short range to destroy enemy weapon emplacements that hindered the infantry's advance. The Germans normally preferred to use their assault guns in large numbers for mutual support rather than singly.